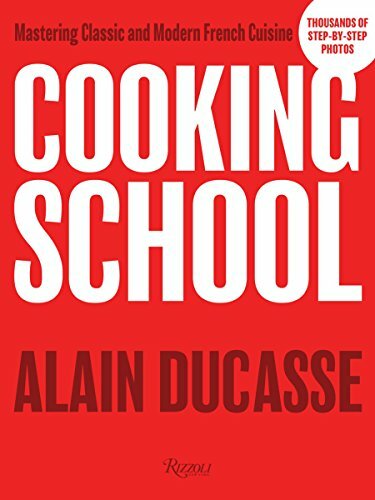 When one cracks open the big Cooking School: Mastering Classic and Modern French Cuisine by Alain Ducasse et. al. one is immediately enticed by the elegant and simple layout, a book divided by recipes into easy, intermediate, and difficult categories with an extensive and useful appendix. Then things get strange. Here’s a nearly 900-page book by a famous French chef and yet the book has utterly no personality. What is this? The title isn’t actually a clue. It has the feeling of “Team Alain Ducasse,” a collection of dishes made over time by students of Ducasse? Or something else. There is no foreword by Ducasse, no introduction, no explanation as the book starts right off with a recipe and some photos showing the making of aioli, perhaps an odd choice for a first recipe in a book subtitled Mastering Classic and Modern French Cuisine. Wouldn’t a fond de veau or Béchamel sauce have made more sense? The first four recipes are Provençal recipes and the fifth, foie gras butter, sticks out like a sore thumb (Who in the world would make this rare and expensive compound butter but a restaurant chef?). Wouldn’t a little section on compound butters have made more sense? By the way, the sixth recipe is also Provençal, maybe because Ducasse is from southwestern France and is presently a citizen of Monaco. Physically, the book is attractive: thick, red, with a spongy hardcover. The photos of the finished dishes are attractive and presented in a restaurant style—not something you would do at home—but the process photos are of limited use and not really helpful. About the recipes, as this book only has recipes: There are no headnotes or explanations to the recipes outside of little sidebar “tips from our chefs.” One must question if this book really is about French cuisine, classic or modern, when we see recipes for apple crisp and brownies which in my book are American desserts. Maybe modern French do eat risotto just as do Americans, but including four risotto recipes in the Intermediate chapter doesn’t make sense for this Italian concoction. Salmon negri sushi is a French dish? At this point Team Ducasse is losing me. Warm Ratte and Vitellote Potato Salad? Those are the names of two potato cultivars which simply are the French names of two cultivars Americans would know as fingerling and Peruvian purple. The fascination with cultivars continues in the Duck Roulade with Apple Chutney, a delicious looking dish, which I suppose you would serve as an appetizer although Team Alain Ducasse doesn’t say. But calling for Belle de Boskoop or Reinette Grise du Canada apples seems almost laughable as is the odd locution “duck tenderloins” which is nothing but boneless breast. This isn’t a bad book. The recipes in themselves are appealing, the organization of the book makes sense, the photographs are attractive . . . but there is a soullessness to the book that leaves one hungry. Nonetheless, the recipes on their own, unrelated to the purported title of the book and its topic, are attractive and read deliciously. If you would like to have some fun cooking—especially if you are a middling cook—then you would enjoy this book. You won’t learn very much about classic French cooking, but you’ll eat well. Clifford A. Wright's most recent of numerous cookbooks is One-Pot Wonders. His other titles include A Mediterranean Feast: The Story of the Birth of the Celebrated Cuisines of the Mediterranean from the Merchants of Venice to the the Barbary Corsairs, with More than 500 Recipes, winner of the James Beard Award for Best Writing on Food in 2000 as well as the James Beard/KitchenAid Cookbook of the year award. His writing has also appeared in such venues as Gourmet, Bon Appetit, Food and Wine, Saveur and other magazines.